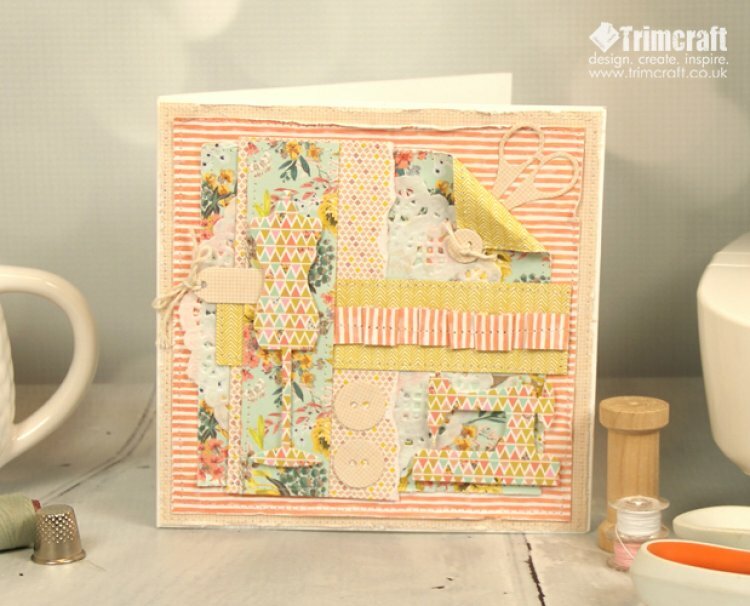 Sewing is always a popular hobby and here we show you how to add a mixed media touch to your papercraft with sewing techniques, your friends will love the detail in this card. Dovecraft double sided tape & small 3D foam squares. 1. Cut a piece of your chosen patterned paper into a 14.9cm square and distress the edges. Use a straight stitch to sew around the edges of the paper and stick to the centre of your white card blank with double sided tape. TIP: It is worth testing your sewing machine with a piece of scrap card to check that it sews fine. 2. Cut a piece of the white and peach striped paper to 14cm x 14cm, again distressing the edges and sew around edges before adding to your card. 3. Die cut the scissors from the Haberdashery set and glue to the right hand corner of the smaller paper piece. 4. We have then cut a different double sided paper to 12cm x 12cm and distressed the edges before sewing around the edges. We then un-plucked and removed the thread and layered a white lace doily to the left of the paper. Fold the top right corner over to show the contrasting paper pattern, stick down with double sided tape. Add the doily layered card in the centre of the card, ensuring that the top right corner only reveals the die cut scissor handles. We have then die cut a small button and fed some twine through the centre to make a knot and stuck it to the corner of the folded paper. 5. We have then cut a piece of the pink and yellow diamond paper to 12cm x 6cm and ripped the right side. With your sewing machine, sew a thread border on the un-ripped side and fix to the left side of the doily. Add a stitched yellow chevron stripe cut to 12.1cm x 3.2cm and stick across the centre of the card. 6. Cut a piece of white and peach striped paper to 1.3cm x 8.2cm and fold it to create an pleated fold and sew across the centre of the paper before sticking to right side of the chevron paper. 7. We have then cut the teal floral Paper Flowers paper to 3cm x 12.5cm and stitched the edges and added to the top of the striped accordion paper. Die cut a mannequin using the geometric paper and add to the centre of the floral paper using foam squares. TIP: Sewing on card can blunt your needles so keep a separate needle for your papercraft sewing. 8. Die cut the smallest tag from the First Edition tags die set and made a bow with twine through the tag. Tuck this next to waist section of the die cut mannequin using tape. Die cut two medium buttons and add to the bottom of the ripped paper. 9. To finish, we have used the same geometric pattern to die cut the traditional sewing machine and added this to the bottom right of the card with foam pads. Who do you know who would like this card? If you have used your sewing machine on your papers projects we would love to see them! Simply upload and share them on the project gallery.